Hi, and thanks for visiting. We are going through a change in communication methods right now and my blog will not be updated. Please check back soon for updates. Please feel free to check out my Principal's Facebook page for information on what's happening at Jackson!! WE HAVE A NEW G.A.T.E Teacher!! My name is Shannon Biggs and I am so excited to be part of the G.A.T.E team at Jackson. This is my eleventh year teaching, and my seventh as a gifted teacher. I am a Michigan native, but Georgia is all I know. I received my bachelor’s degree from the University of Georgia and both my master and specialist degrees from Brenau University. Please check my Weebly: www.biggsgate.weebly.com often for classroom updates and pictures. Also, take a moment to complete the parent form under the Important Information tab. I look forward to a wonderful school year! If you are in the building, stop by and introduce yourself! Do you know what's really difficult? Teaching writing! I mean it's easy to teach the mechanics of writing: capitalization, punctuation, and the use of language. What is difficult to teach are the conceptual writing components: ideas, focus and organization of the piece. Many times our students have great ideas in their heads but have difficulty expressing themselves on paper. So what are we doing about our writing program? Through the support of the WT Jackson Foundation, we are approaching writing from a few angles. First, we've looked at our curriculum and are adopting the Writer's Workshop model. 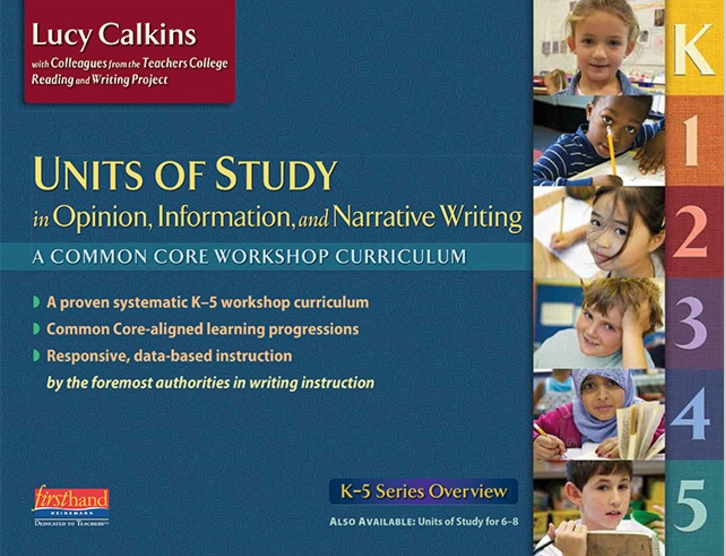 This model utilizes the Lucy Calkins writing curriculum which focuses on three units of study: Narrative Writing, Informational Writing and Opinion Writing. Based on the needs of our students, Jackson will focus on the Narrative Unit of Study this year. This will be a training year and a soft roll-out of the new curriculum (as our teachers learn), but you should begin seeing the strategies and hearing the language of the Units of Study. For a full overview of the Units of Study, please see the comprehensive overview guide available to the left. Second, we are also participating in writing benchmarks called WriteScore. Jackson participated in these benchmarks last year which helped us gather valuable data to aide in shaping our writing instruction in the classroom. During our October conferences, teachers will share the feedback we received from last year's administration of WriteScore. Next week, grades 2-5 will be participating in the first benchmark for Informational Writing. Teachers should have the data from this administration to share in the October conferences. For more detailed information on what and how WriteScore assesses, please see the Resource Guide available to the left. Here is a snapshot of our Spring '17 Milestones' Data around Writing. While our students do well in most areas, we do have room to grow. 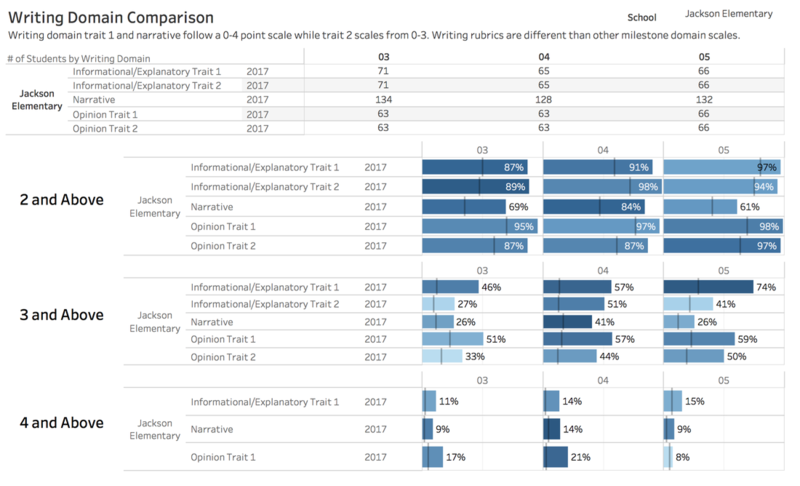 Our data trends higher in Informational and Opinion Writing thus the focus on Narrative Writing this year. More detailed information will be shared in parent teacher conferences. We'd like to recongnize and thank our experts for sharing their knowledge. Additional teacher-led sessions will be scheduled for October and November!! We have AMAZING teachers at Jackson!! in October, each teacher will be reaching out to schedule a parent\teacher conference. Please look for your invitation from your child's teacher. This month we celebrate our students who have been recognized as RISK TAKERS by their teachers. Risk Takers are identified as students who approach unfamiliar situations with courage, and like to explore new ideas. They are brave and stand up for what is right. Each month teachers will identify students in their class that exemplify the IB Character Trait of the Month. While we know that all of our Jaguars display the IB characteristics, we want to recognize and celebrate our students!! ​Way to go RISK TAKERS!! Our IB learners are TAKING ACTION!! One of the principles of IB is action. Our 4th grade students are taking action and are telling others. The 4th graders using the skills that they learning about types of writing to create commercials that they felt would inspire others to take action. What actions do they want us to take?? Watch their PSAs to find out!! Our teachers now have access to their grade books!! The district experienced some issues at the start of the semester that delayed our teachers inputting grades. You should now be able to access IC and monitor your child's progress. If you do not have access to IC, please contact the Jackson Main front office for assistance. What to do AFTER Curriculum Night!?!? Did you know that there are Eureka Math letters available to help parents with each lesson or group of lessons that support the same standard? On the parent letter you will find an explanation of the strategy used in class to solve the math problem. It's important to remember that in Eureka Math we are teaching multiple strategies to solve problems, beyond the algorithm, to deepen the understanding of the concept. There are also suggestions on how you can help support your child at home with these mathematical concepts. Ask your teacher about your parent letters, or access them by following the link to EUREKA MATH PARENT LETTERS. You can also visit the RESOURCES FOR PARENTS page on my blog! Here is another great resource for helping parents with Eureka Math Pacing. "A Lexile measure is a standard score that matches a student’s reading ability with difficulty of text material. A Lexile measure can be interpreted as the level of book that a student can read with 75% comprehension. Experts have identified a 75% comprehension level as offering the reader a certain amount of comfort and yet still offering a challenge. The Lexile® map shows Lexile measures ranging between approximately 200L and 1700L. However, some reading materials and readers do have Lexile measures below 200L and may have a code of BR* for beginning reader." How are we supporting this framework at Jackson? Through our Fountas & Pinnell measures. Teachers assess and monitor students' growth through the year to ensure that students are making adequate progress and growth. More information regarding the DOE's Framework and F&P can be found on the ﻿RESOURCES FOR PARENTS﻿ page. K-2 Fundations: Fundations is a multisensory, systematic, and explicit phonics program used in all classrooms from Kindergarten-2nd grade. Fundations aligns with Georgia’s Standards of Excellence and takes an integrated and comprehensive approach to teach reading and spelling. Using the principals of Orton-Gillingham, Fundations provides research-based materials and strategies essential to a comprehensive reading, spelling, and handwriting program emphasizing phonemic awareness, phonics, reading fluency, handwriting, and spelling. **All of the teachers in grades PK-2 have completed (at minimum) the 30 hour Orton-Gillingham training to support our students. . These are the same strategies utilized with students at The Schenck and the Speech Schools. This year the standards for Science and Social Studies have changed across all levels. Many of the resources for both of these subject areas are now available online for teachers, parents and students. Ms. Lynn Freeman, our Instructional Technology Specialist, will be holding a training for parents on how to access the digital resources available in MY BACKPACK. This training will be available on September 8th @ 9:30 in the Main Campus Media Center. Please download a copy of the 2017-2018 JACKSON PARENT\STUDENT HANDBOOK. Click to see how we are making safety glasses safer for K-2!! Learn more about SPARK Day here! Small Fry to Go at Jackson!! The Trout (like Winter) are coming!! As many of you know, there will be a pretty substantial event occurring Monday Aug 21st. Atlanta is in the path of a near total solar eclipse. The school day on Aug 21st has been extended by 30 minutes so that we can share this event with our students. The school will provide students who are in attendance during the eclipse on Monday Solar Eclipse Glasses that have been ISO certified. Our glasses were manufactured by American Paper Optics and Rainbow Symphony. Both of these manufacturers are on the American Astronomical Society’s reputable vendor list (verify manufacturing information HERE). Jackson's plan is to take students out on the field to observe the eclipse using the eclipse glasses. In preparation for the eclipse, we ask that you please use the link for the resources below and speak with your child about the importance of following the safety protocols that are set. For parents who wish for their students NOT to participate in the viewing, we ask that you please complete the form below. Students who are in attendance will participate in the viewing unless the school receives notification that they may not participate. Those opting out will live stream the eclipse inside. **Students are not allowed to wear glasses from home. They must wear the glasses that have been verified by the district. We cannot verify glasses brought in from home so they will not be allowed. The format of Curriculum Night will be a little different this year. Curriculum Night will begin at 5:30 and will consist of three rotations. The rotations begin at 5:30, 6:05 and 6:40, the rotations will last for 30 minutes with a 5 minute transition between sessions. At curriculum night you can expect to gain a better understanding on the level's curriculum, classroom procedures, STEM program, IB Signature Program, PBIS Program and other topics the classroom teacher feels are important to discuss. Curriculum Night is not a time for individual parent teacher conferences as there is limited time available on that evening. Levels will hold individual fall conferences in October after teachers have had a chance to gather academic data on their classes. Please plan on joining us for this informative evening. Please join our IB Coordinator - Ms. Pete and our STE(A)M Coach - Ms. Dostie as they discuss how these two programs will impact Jackson this year! Ms. Pete will explore the concept and inquiry based direction our teachers are taking within their curriculum to challenge our students, and Ms. Dostie delve into STE(A)M to better explain our vision of STE(A)M education. K-2 students will be visited by the STE(A)M truck on the 23rd-25th. The STE(A)M truck will SPARK our Jags interest in Science, Technology, Engineering, Art and Math! After seeing all of the amazing STE(A)M activities that our 3rd-5th graders participated in, I'm sure that this SPARK will turn into an INFERNO!! THE TROUT ARE ON THE WAY, THE TROUT ARE ON THE WAY!! The trout are arriving this week!! Want to know how the trout supports STE(A)M and teaches our students about life cycles, ecosystems and ecology?? Check out the video about Jackson's newest resident. Each month we will recognize an IB STAR from each class to participate in our IB STARS Breakfast. This is just one way that we celebrate our students at Jackson!! August 23 - Curriculum Night 5:30-7:15 (three sessions with sessions begin each 30 minutes). What a Week for the Jaguars!! Mr. McBride is in the SILVER HOUSE!! YELLOW HOUSE celebrates its new members!! Students review their learning goals for todays STEAM Truck visit. Completing circuits in the STEAM Truck! The STEAM Truck challenging our students through engineering! Teachers receive "flair" to wear on their lanyards for making changes at Jackson. Ms. Maguire and Ms. Webb earned their butterfly flair for "Making a Change". The Admin team TREATED teachers to breakfast on Friday for an amazing start of school!! This year all of our instructional and cultural efforts at Jackson will support our Strategic Plan. The GO TEAM worked during the 16-17 school year to develop the strategic plan, which is the document that outlines Jackson's action plan towards meeting its vision of learning. This past week, Jackson teachers supported the strategic plan through work around our PBIS plan, STEAM program and development of the leveled book room to support our literacy goals. The GO TEAM will review the Strategic Plan at our next GO TEAM meeting on September 7th. Please feel free to join us!! 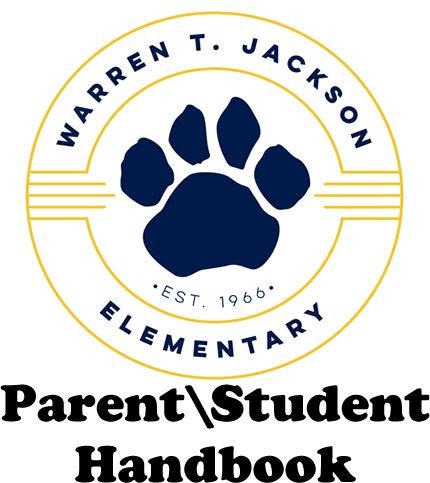 The teachers at Jackson have worked diligently to implement our new PBIS plan (Positive Behavior Supports and Interventions) at Jackson, including our new ROAR essential agreements and our technology based behavior management system, Class DOJO. We are starting a campaign to have 100% class participation in Class DOJO. As parents, you will receive real time information on your child's daily behavior through the awarding of "positive points". More information will be provided at Curriculum Night on August 23rd. We also celebrated our new House System with the students at a high energy house selection assembly! Each student selected their house at the ceremony and you could feel the excitement in the air. Please check in with your kids to see what house they joined today! SPARK DAY: AT MAIN CAMPUS - THE STEAM TRUCK VISITS JACKSON!! This week, teachers have worked on aligning their entire grade level's new Science and Social Studies curriculum with our signature IB program. Teachers have aligned the new standards and meticulously combed through numerous new resources provided by the district to determine which ones would be most beneficial and provide enrichment for their students. A shout out goes to Ms. Maguire and Ms. Webb for all of their work in getting the leveled book room up and running! They worked with Ms. Gamble, our literacy consultant, at Main to get the F&P aligned leveled book room ready for use. They will be training teachers on the 17th with using BOOKSOURCE and checking materials in and out of the leveled book room for use during instructional times. Ms. Maguire and Ms. Webb both received the "Making a Difference" flair. This flair represents the "changes" they've helped make. If you would like to Make a Difference, there are volunteer opportunities at the Primary and Main campuses in getting this resource ready for use with our students!! Just let Ms. Maguire or Ms. Webb know that you are interested in this volunteer opportunity!! Due to the solar eclipse on Monday, August 21, 2017, Atlanta Public Schools will delay dismissal for all students by 30 minutes. This extension of the instructional day will allow students to experience the solar eclipse while also ensuring student and staff safety. According to National Aeronautics Space Administration (NASA), the solar eclipse will be visible (weather permitting) across all of North America and in Atlanta from around 1:02 p.m. and end at 4:00 p.m.
APS teachers will engage students in the investigation of the solar eclipse through various grade-band specific activities and instructional lessons. All staff have been provided with safety information. 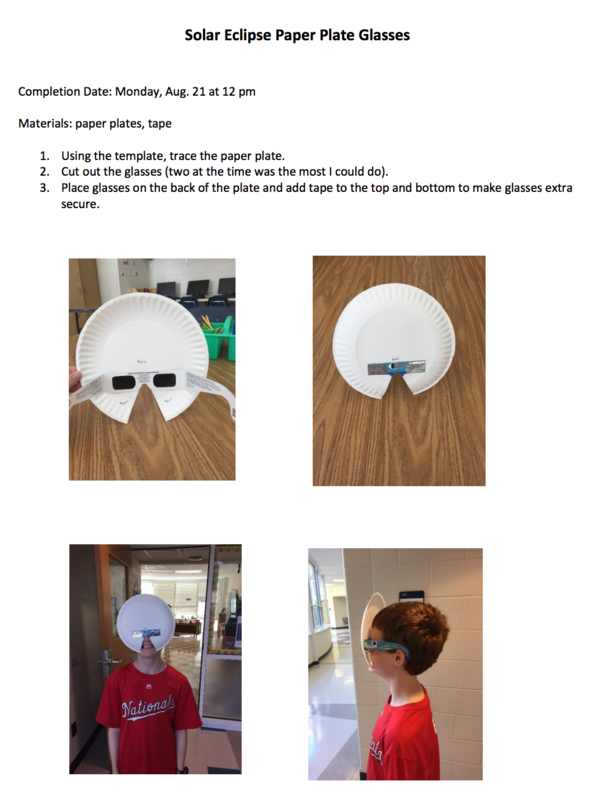 Additionally, the district has ordered over 50,000 “eclipse glasses” for students to safely view the eclipse. Please notify your child’s teacher if you would like for your child to not participate in any eclipse-related activities. You are welcome to pick up your child early if you choose, however, the buses will run 30 minutes past the regular times. Jackson is very excited about the direction that we are taking in the upcoming school year. As many of you know, APS experienced some challenges with the budget due to tax issues with the City of Atlanta. Facing these budget short comings, the Jackson Community as really stepped up. We are very grateful for the support the community, through the GO TEAM, PTA and Foundation, has provided us for the upcoming school year. This year, the changes we will experience at Jackson will be impactful to our academic programs and less visible through physical changes. Through the support of the community we are investing in our Media, Literacy, PBIS and STEM programs. The Media Program support will be seen through the staffing of a Media Specialists on both the primary and main campuses. Support will be seen in our Literacy Program though a balanced literacy approach. We have made substantial investments into our leveled book room, writing programs and progress monitoring. We are taking an individual approach to literacy instruction that looks at all students on an individual basis. Your child's teacher will share additional information about our literacy program during Curriculum Night on August 23rd. Our STEM program is an expansion of our inquiry based instructional program that supports our IB Signature Program. STEM will support the development of our students in an ever changing world where STEM skills are becoming essential. Our students will experience hands on STEM concepts through our trout hatchery to explore the life cycle and our local ecosystems, coding and robotics to name a few. Our STEM Specialist will be engaging our STEM Committee which is comprised of parents and teachers to develop our emerging STEM Program. Lastly, PBIS will be our approach to school wide positive behavior. A teacher committee spent the past year designing a program that will celebrate our students successes and set consistent expectations of behavior. Our PBIS program will continue the work we have already begun with the implementation of the SEL (Socio-Emotional Learning) Program. While the impact of the annual fund may not be as visible this year, I can assure you that the impact to our academic programs will be immense. Our goal this year is to invest in our programs and teachers so that we continue to offer a strong program that will prepare out students for their world beyond Jackson.